So here is my modest home theatre setup! 1. Kodi 17.6 Android on a "China box". Works flawlessly though! 2. 7 TB media server running Windows 7. Kept on sleep mode, turns on via WOL as soon as Kodi launches. Goes back to sleep after 10 minutes of idling. 3. Samsung 40" Full HD LCD TV. 4. Logitech Z-5500 5.1 THX speaker system. 5. Samsung blu-ray player for my BD collection (165 movies). 6. OneForAll 6 device Universal remote that controls all my hardware. 6. A pair of smart LED's that are connected to Kodi, so lights elegantly fade and turn off whenever I hit play on any video! The "China Box"! Logitech Bluetooth device on top is for playing music from my phone on my HT speakers. 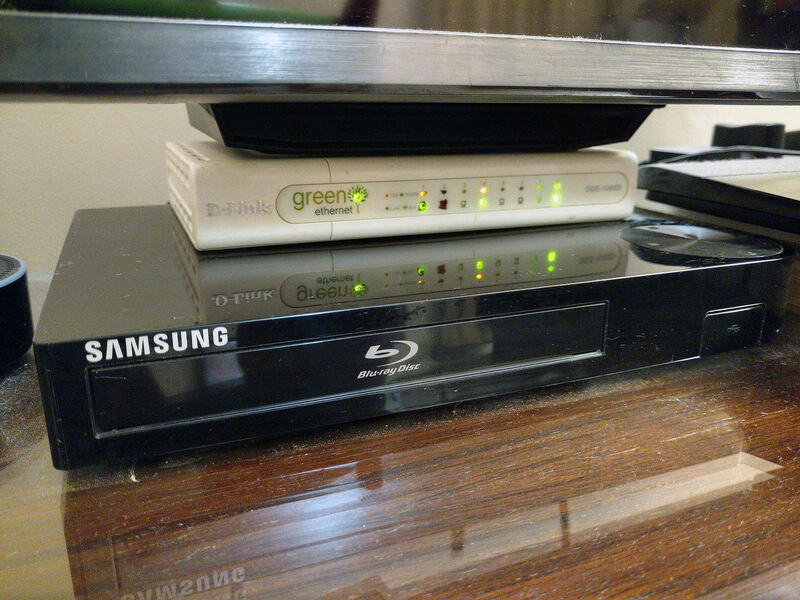 Samsung Region B blu-ray player. I import all my BD's from the UK. Gigabit LAN switch on top, with the main internet router on top of that. The heart of all the sound processing magic! Bought this speaker set way back in 2007, still working perfectly! 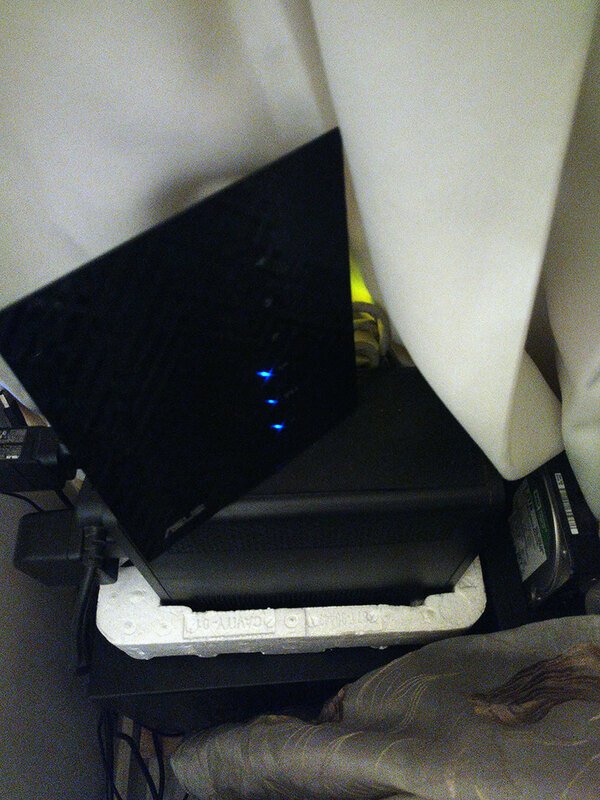 File server hidden in a corner of my living room as it is too loud for the HT room! House is on the main road, so living room in front is pretty noisy anyways the whole day. Old AMD Athlon based system with 4 GB RAM. UPS, WiFi Access Point and external HDD dock on top of it. Nearly 150 views but no response? You could also make more than 1 photo, detailing certain aspects of your setup. It may not be the fanciest setup we have ever seen, the most important part is that every thing of it works for you as you want. I too still have a 1080p tv, but right now I simply don't have enough 4K content to justify buying a 4K tv. I'd probably buy a Gemini Lake PC solution, not a Odroid C2. I love seeing all hardware posts great and small, as each deployment of kodi is unique, and I always find it interesting to see how people use it to watch their content. Updated original post with more pics! Yup, I'm currently very happy with my setup. It impresses anyone who sees it, and is loud enough to drive my wife nuts! I've read the "Choosing the right Kodi hardware" thread, and come to the conclusion that an AMLogic based box is the best bang for the buck, easiest to setup, etc. I definitely don't want to go the full blown HTPC route, as it can get really expensive, especially if HDR and lossless audio is a requirement. 4K TV is in my really long term plan. But manufacturers are pushing 4K hard, and by the time I really get round to buying one, it will be the minimum standard. Currently all my content is at the most 1080p. I don't really see myself with a pure 4K library for at least another 8 to 10 years. Biggest hurdle being the huge file sizes! (2018-05-22, 14:32)tjay260476 Wrote: I love seeing all hardware posts great and small, as each deployment of kodi is unique, and I always find it interesting to see how people use it to watch their content. Me too. I've come away impressed at people's setups at both ends of the spectrum on this forum as well as a couple others. I think nowadays that a full blown HTPC is overkill unless it’s also hosting the media as well as Kodi, for me the Raspberry Pi was the way to go, especially that the boards are only £32 each! Also with you on the UHD content, so will see you in the queue when we both need a new set! Lastly, great photos.... far from modest! (2018-05-22, 20:13)tjay260476 Wrote: I think nowadays that a full blown HTPC is overkill unless it’s also hosting the media as well as Kodi, for me the Raspberry Pi was the way to go, especially that the boards are only £32 each! Yeah, besides being expensive to setup, they also draw a lot of power. My AMLogic box on the other hand runs off a 5V, 2A adapter! Same with a Pi! It is overpriced now as it has become a collectors item. 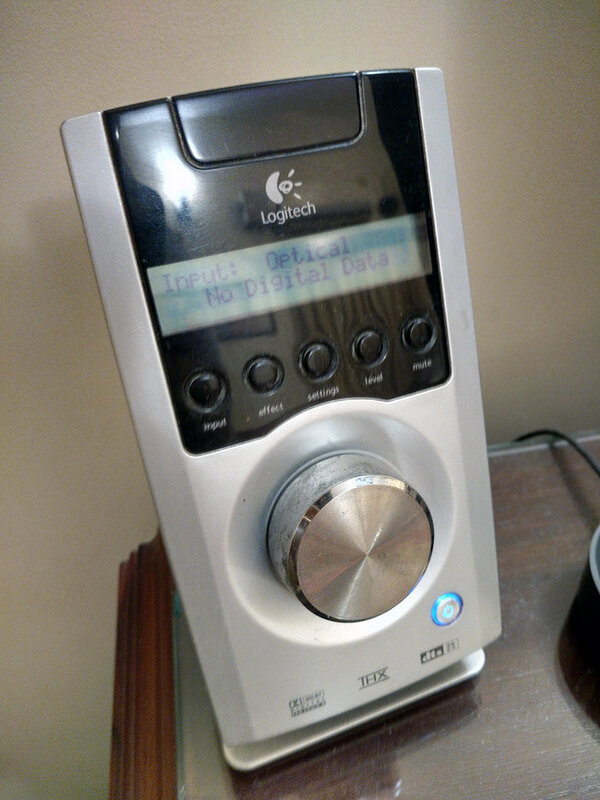 Logitech stopped manufacturing this set years ago! Besides, I bought it for £200. Time to sell now for a profit maybe?! Sorry! The only way I'm getting rid of it is when it finally gives way ( ) and I can't find any replacement parts. I love this set too much to part with it, no matter how I can get for it! 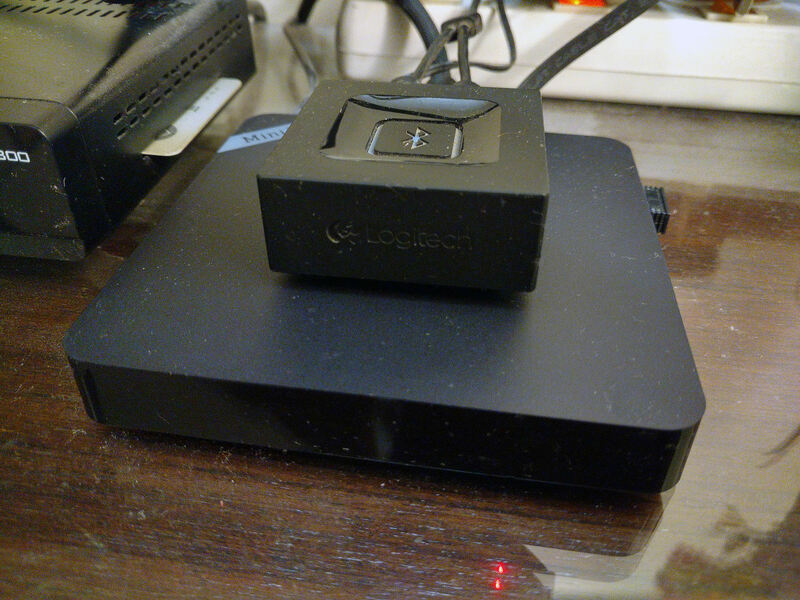 Using cheapish amlogic devices as frontends myself, replacing Windows (nuc) systems for this purpose. Agreed, it is hugely outperforming my expectations using 10 times less power which is always a plus to me. I like your setup. I’ve been working on building my own one up for 10 years and I will be posting it’s current state over the next few days. It’s really great to see some old components still having huge value in the setup.